The Honor View 10's launch is a significant one in Honor's history. It was known as Honor's V-series and it was only available in China. Honor's rebranding to "View" series comes at the same time as the company's decision to launch the smartphone outside of China as a high-value or bang-for-buck smartphone. Yesterday, it was reported that Samsung is entering the cryptocurrency market by making ASIC (application-specific integrated circuit) chips for mining hardware companies. Samsung has now confirmed this news to TechCrunch. This news follows Samsung’s Q4 2017 earnings, where its semiconductor business has performed stupendously well to emerge as the largest chip maker in the world by ending Intel’s 24-year reign at the top. When asked for a comment, a company spokesperson told TechCrunch “Samsung’s foundry business is currently engaged in the manufacturing of cryptocurrency mining chips. However, we are unable to disclose further details regarding our customers”. The spokesperson refused to divulge any further details on this. Making ASIC chips makes business sense for Samsung as it also manufactures many components used to build mining rigs. Samsung already makes high-performance memory chips for GPUs and industry-leading SSDs. While GPUs were traditionally targeted at gamers, they have a found a new market in cryptocurrency mining. In the last couple of years, mining has moved from relying on consumer-grade graphics cards to ASIC chips, which are better suited for mining in terms of efficiency and performance. Unlike normal computer chips which are designed to perform a variety of functions, ASIC mining chips are specifically built for a single computational task: to compute hashes very quickly. This makes them faster at mining and more power-efficient – both of which are key considerations for building a mining rig. Samsung now joins the Taiwanese chip maker TSMC in the cryptocurrency space. Samsung will be selling its ASIC chips to companies that build and sell ready-to-use mining rigs in the market. It is not yet clear how big the market for ASIC chips is for the largest chip maker in the world to invest its resources in, and if it makes any significant impact on company’s already impressive bottom line. The post Samsung confirms making ASIC chips for cryptocurrency mining appeared first on SamMobile. Samsung will seed the official Oreo firmware update for the Galaxy S8 and S8+ to registered Beta testers 1 day before the general public. The firmware will carry the new Samsung Experience 9.0 under Android Oreo but there's still no official date for its release. We hope the update is just days away and judging by that announcement it probably is. Thanks for the tip, Pranjal! As you may or may not know, Samsung spends a considerable amount of money on research and development every year. With the way tech is shaping up these days, one can only expect an increase in the efforts applied to this extremely pertinent portion of the business. Last year we saw Samsung India hire 800 engineers for its R&D facilities, and this year they seem to be upping the ante. Samsung India will hire 1000 engineers this year from top institutes in the country including 300 specifically from IIT. The focus for the new hires will be new age technology such as artificial intelligence, machine learning, signal processing, computer vision, Internet of Things and mobile security. Dipesh Shah, the Managing Director at the Samsung R&D institute in Bangalore says that “there is a large need for talent” to help move the company forward in these fields. Aside from hiring computer science students, Samsung will also hire students from diverse streams such as electrical engineering, applied mechanics and statistics, etc. The three research facilities in India focus on both local and global innovative technologies. As we saw in Q4 2017, the facility in Bengaluru began working on 5G technology. In addition to that, the Bangaluru facility was the one that carried out the final steps of development for Bixby. As Samsung continues to make strides toward its vision of a smart and connected home, we can expect to continue to see increases in the efforts toward achieving this goal. The post Samsung to hire 1000 engineers for three R&D centers in India appeared first on SamMobile. While VLC is the default go-to media player for many users on their computer, it is not always the case when it comes to Android. Between pre-installed media players from OEMs and dozens of great options on Google Play, users have plenty of choice on their mobiles and tablets. It is not that VLC is not popular, but there are equally good or better options on Android. Given the not-for-profit nature of VLC, the development of VLC on Android has been a bit slow compared to other popular media players. It picked up more pace in the last few months adding more features and improving the performance in general. In the latest beta release version 2.9.0, VLC for Android has added a new feature which should make Samsung DeX users happy. The app is now optimized to work in Samsung DeX environment. The timing of the VLC update seems to be just right as Samsung is reportedly planning to launch a new DeX dock this year at the official unveiling of the Galaxy S9 and Galaxy S9+. The VLC beta version also adds support for Chromebooks and experimental support for Chromecast. For those who are not aware, DeX (Desktop Experience) is a feature launched by Samsung with the Galaxy S8 and Galaxy S8+. It allows users with Galaxy S8, Galaxy S8+, and Galaxy Note 8 to connect their devices to a monitor, keyboard, and mouse via a DeX dock (sold separately) and use their phone as a PC. DeX environment is optimized for keyboard and mouse use for a more productive experience. It also supports running apps in a windowed mode similar to a desktop operating system. At the launch of DeX, Samsung announced that Microsoft apps on Android are optimized to work in DeX. Now, with support for VLC in DeX environment, both the work and play parts are covered well in the DeX mode. The post VLC for Android adds DeX support in its latest beta appeared first on SamMobile. Many Samsung investors had been calling on the company to boost shareholder returns so the company launched its Shareholder Value Enhancement Program in 2015. Since then, it has given out billions in dividends and spent billions on buying back shares to cancel them. The company confirmed in 2016 that it was thinking about a stock split. The company’s board has approved a 50:1 stock split today as Samsung posted record profits for the final quarter of last year. It says that this decision was taken after many requests for a stock split were received based on the view that a high share price was keeping away retail investors. Samsung Electronics’ stock price closed at 2,495,000 won today which is roughly $2,342 per single share. Assuming that the Korean stock exchange has set a 10 share lot size for Samsung Electronics, it would mean that anyone willing to buy shares in the company must have at least $23,420 to buy a single lot. A 50:1 stock split means that existing shareholders will receive 50 new shares for every single share they hold. This doubles the float – the total number of shares available for trading – and cuts the stock price in half. Samsung believes that this stock split is going to make investing in the company more accessible to retail investors and will also provide dividends to a wider range of investors from 2018. It’s also going to add more liquidity to the company’s stock. The board also approved a year-end dividend of around $20 per share today. It has already committed to doubling dividends this year. Samsung will increase annual dividends by 100 percent in 2018 and it’s going to maintain that level for 2019 and 2020. The post Samsung announces first ever stock split to boost shareholder value appeared first on SamMobile. Samsung became the world’s most profitable tech company in the second quarter of last year but that wasn’t the only record it broke. It also ended Intel’s 24-year reign as the largest semiconductor-based chipmaker in the world. Samsung posted higher revenue and operating profits compared to Intel during Q2 2017. That wasn’t a one-time thing. Samsung’s semiconductor business has seen a terrific boom in the past year and that has helped the company close out 2017 not only with record profits, but properly dethroning Intel as well. Samsung is now the largest chipmaker in the world by revenue. It’s not like Intel had a bad year in 2017. Sales were up six percent and the company posted a healthy growth in revenues, bringing in $62.8 billion last year but it wasn’t enough to match Samsung. The Korean giant revealed in its Q4 and year-end earnings result today that its semiconductor division generated $69.1 billion in revenues last year. You might be wondering how Samsung has been able to do that given that Intel processors are found in a significant majority of all computers in the world. Samsung makes processors for mobile devices not for notebooks and desktops. Samsung has dethroned Intel because of memory chips which are a crucial component for both smartphones and computers. It has built a dominant position in the memory chip market. It will be difficult to find a smartphone or tablet these days that doesn’t have a Samsung-built RAM inside. It’s also becoming increasingly dominant in the solid state drive market. It’s ironic that Intel may have handed over the crown to Samsung itself even if it took the latter more than two decades to take it. Intel created its memory business in the 1960s but it left the market when competition from Japanese companies grew significantly in the 1990s. Samsung kept its head down and steadily established a position of dominance in the memory business. It’s capital expenditure on consolidating and securing its lead now crushes rivals. Intel recently entered the memory business once again but it’s going to take the company a very long time to catch up to Samsung. The Korean giant expects to keep raking in the cash from its semiconductor division. It’s right to assume that as mobile device shipments continue to grow. Moreover, memory chips are also making it into smart home devices and even cars. Samsung’s position of dominance and ability to mass produce these chips at scale puts it at an advantage. The post Samsung has emerged as the world’s largest chipmaker, dethrones Intel appeared first on SamMobile. Samsung is primarily a hardware company, but that doesn’t mean it hasn’t tried its hand at services. Back in 2014, Samsung launched its Milk music streaming service in select markets, only to shut it down a few years later. With rivals like Apple making a good chunk of money from services, it is expected that Samsung would want to replicate the success. Being the largest smartphone vendor in the world gives Samsung an enviable opportunity to pre-load its services on its devices. Samsung has filed a trademark application with the EUIPO (European Union Intellectual Property Office) for the brand name ‘Uhssup’ on January 26, 2018. The trademark application describes it as a mobile app that allows for sharing real-time locations of users and communicating with friends. None of this sounds any different from what other popular messaging apps already offer. So, it is not yet clear what Samsung’s rationale is behind this service if it’s intended for public release, although the implementation will hopefully be better than the now-defunct ChatOn service. Of course, a trademark application alone doesn’t guarantee the launch of a product or a service. Samsung patents and trademarks many ideas and names which never make it to the market. However, this trademark does look a bit more focused and may actually launch sometime in the future. If it does, let’s hope Samsung adds enough functionality to justify its presence on Samsung smartphones. The post Samsung trademarks ‘Uhssup’ for possibly its own messaging app appeared first on SamMobile. It’s only a matter of time before Samsung starts rolling out the official Android 8.0 Oreo update to the Galaxy S8 and Galaxy S8+, with the beta program having ended in every country where it was made available. Galaxy S8 and S8+ owners will be scrambling to download the update once it goes live, but have you prepared your phone well enough for its first major Android OS upgrade? We’ve put together a couple of tips that Galaxy S8 and Galaxy S8+ owners should follow to ensure they jump over to the new version of Android without any issues. Check them out below! Running into data loss with official updates is a rarity these days, but it’s a risk one should avoid taking with major updates, so backing up your data is important. Even if the Oreo beta installs fine, you can rest assured you have a backup to fall back on for apps and data if things start to go wrong after the update is installed and, heaven forbid, you have to do a factory reset to bring things back to normal. The quickest way to backup all important data is by using Samsung’s Smart Switch software on a PC, which backs up SMS, phone and home screen settings, call logs, apps, images and other media, documents, and more. You can also use the Smart Switch app on your S8 or S8+ and backup everything to an external USB drive using an OTG connector (instructions for this can be found in our Smart Switch guide). Samsung Cloud is the option to use for backing up to Samsung’s cloud servers, although the 15GB of free storage is limited and hence unsuitable for backing up things like images and videos. But it’s perfectly fine for phone settings, call logs, messages, apps (but not app data, which will be disabled for third-party apps in February), your home screen setup, alarms, documents, and voice recordings. 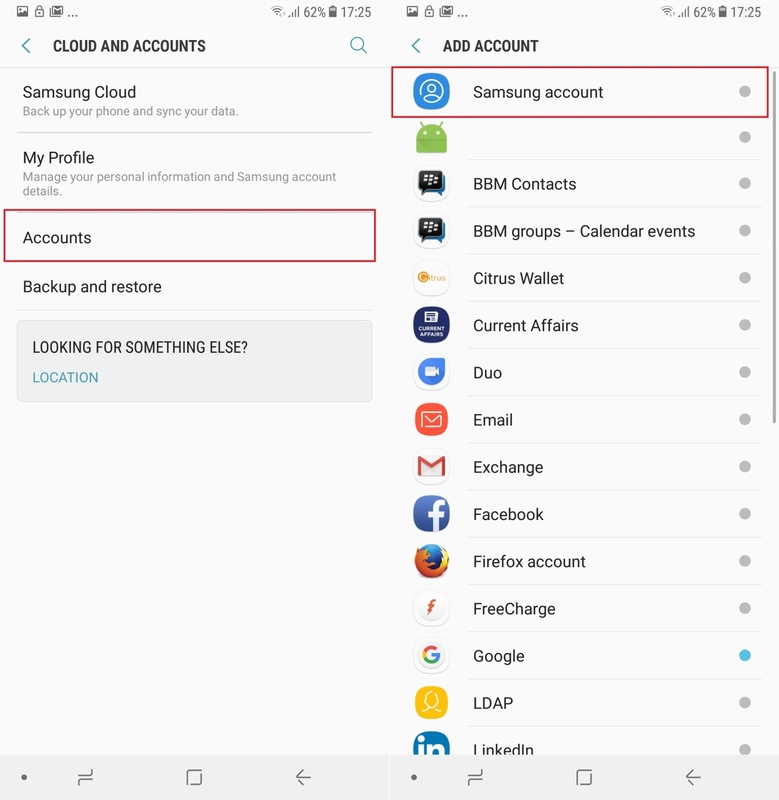 Samsung Cloud can be found in the Settings » Cloud and Accounts menu; you’ll need a Samsung account to use it, and you can create one from the phone itself if you don’t already have one. There are also a ton of apps on the Play Store that let you backup data like SMS, call logs, calendar entries and more. Super Backup is one such excellent app that’s free of cost (with ads). Some of these apps can upload those backups to different cloud services (like Google Drive and Microsoft OneDrive) so you can retrieve them at a later time. Most, if not all, apps can also save backups on the external storage if you have a microSD card in the phone. Speaking of the microSD card, there’s no need to take a backup of external storage contents since external storage isn’t touched during an update. If you’re still concerned, you can simply remove the microSD card before installing the update instead of wasting time backing up its data. If you happen to be running low on internal storage and usually just ignore the related notifications the phone throws at you, it might be an issue when Oreo comes knocking. Major updates are usually at least a 1GB over-the-air download, and you also need some space for the update to install. A good rule of thumb here is to keep at least 3GB of storage free on the internal storage. If you have a microSD card, you can move some apps and image and other media files from the internal storage. If not, then uninstalling a few big apps that you can always install later can get the job done. Tip: If you’re planning on uninstalling a few games, make sure that game supports backup of your progress on Google Play Games or another service, or you’ll have to play everything again. Gameloft titles usually let you restore progress from your Google Play Games account after you’ve gone through the introduction levels. Candy Crush, meanwhile, can sync your progress with your Facebook account. You can also let the phone manage things and clear data using the Device Maintenance menu in the phone’s settings. Just go into the device maintenance section, tap the Storage option, then select the Clean Now option to free up space used by app caches and other minor data. Software updates usually require 20 percent of battery charge to install, but depending on your internet speed, the Oreo update can take a few minutes to download. So it’s a good idea to make sure your phone stays at least 30 percent charged in the next couple of days, so that you can immediately start downloading and installing Oreo once it becomes available. This step isn’t a necessity, but it’s a suggestion you should follow unless you want to be waiting around for the phone to charge after Oreo hits. This is something you can do after you’ve upgraded to Oreo, but if you want to waste no time getting back to business once the software update completes, it’s a good idea to update all your apps from the Play Store before installing Oreo. This is important if you haven’t updated apps for a long time and/or have automatic updates disabled in the Play Store, as many apps might have been updated for Oreo support in recent days and will work as intended after your S8 or S8+ makes the jump to the newest version of Android. What if the Oreo update arrives for your device in the dead of night, when you’re fast asleep and dreaming about its imminent arrival? What if you’re so busy you have no time for checking the phone for the update? Well, you can schedule to install software updates at a particular time. To set a schedule for software updates, open the phone’s settings, tap Software update, then use the scheduler option. It’s recommended to select a time that falls somewhere in your sleeping hours; you don’t want the phone restarting while you’re using it, do you?. Having your phone sufficiently charged Having your phone connected to a charger is also recommended if you schedule updates, and so is the part about backing up all your data and having enough free internal storage. That’s our list of things that you should take care of before upgrading to Android 8.0 Oreo on your Galaxy S8 or S8+. None of it is necessary, but it’s good practice if you want to leave the older version of Android behind with complete peace of mind. Let us know if you think there’s something else that should be on this list, and hope that we don’t have to wait too long for the official Oreo update! The post Galaxy S8 Tip: Prepare your phone for the Android 8.0 Oreo update appeared first on SamMobile. Not many topics keep Android users on their toes as much as big, feature-rich updates. And with the Android 8.0 Oreo update on the horizon, we are once more bombarded with questions. Will the Galaxy S8 get that update? When can I update my Galaxy S7? How about my Galaxy S6? Here we share what we know. Be smart and bookmark, since we’ll be updating this article whenever new information surfaces. We’ll get right to the question of which device will be updated, but we can not make any predictions regarding a timeline. So, for example, we can say that the Galaxy S8 will, of course, get the Android 8.0 update, but we do not yet know when. If you’re looking for all the latest news about Samsung’s Galaxy and Android Oreo, scroll down past these lists to find all headlines with related news. So, you ask, how do we get to these lists? Tracking Samsung’s Android updates over a long period of time, it is clear many series and devices always get two major OS upgrades, before continuing with security updates only. However, as indicated above, this rule is not firmly established for most of the Galaxy J series, nor for several other devices. Over time, we’ll be updating the information above when we receive new information, or when it surfaces elsewhere. We have not included devices that have already stopped receiving major OS upgrades, like the Galaxy S5 or Galaxy Note 4, even if they still receive new security patches regularly. Other devices missing from this list will be added if and when we have tangible information to report. One last thing we have to point out, is that we are, of course, not Samsung. This list is by no means based on official information and only enumerates our predictions, not Samsung’s official update policy. Should our information be proven wrong, we will update this article, but we are not responsible for your device’s updates. If you think we missed a device from the last two years, let us know in the comments and we will try to add information about that device to our list. December 8: an actual early build of the Android Oreo firmware for the Galaxy Note 8 has leaked. October 15: a quick reminder that Galaxy phones on Android 7.0 will go straight to Android 8.0. There will be no Android 7.1.x for devices like the Galaxy S8. August 21: it’s official, Android 8.0 will be known as ‘Oreo’. We expect concrete information about the update for several Galaxy devices to surface in the next weeks. June 27: first list of Galaxy devices that will get the Android 8.0 update. The post These Galaxy devices will be updated to Android 8.0 Oreo (updated: January 31) appeared first on SamMobile. It has been rumored for a few years now that Samsung is working on a foldable smartphone. We’ve heard countless rumors and seen many patents but Samsung is yet to launch such a device. Recent reports suggested that it may be out in early 2018 and while Samsung itself said that it would launch the foldable smartphone in 2018, it’s unclear when the company might do that. It was reported earlier this month that Samsung will finalize the foldable smartphone’s design in March this year and start producing the foldable OLED panels for it in September. That meant we’d see Samsung officially unveiling the much-rumored foldable smartphone either in December or early 2019. Samsung mentions in its Q4 2017 earnings release today that its OLED panel is going to improve its competitiveness in the premium segment this year “with the release of foldable panels.” Since the company sources OLED displays for its smartphones from its display-making subsidiary, that part of the company has to start producing foldable OLED panels before the mobile division can put a device together and launch it. Samsung also mentions in its press release that the mobile division is going to try and differentiate its smartphones by adopting cutting-edge technologies “such as foldable OLED displays.” This goes to show that Samsung is still very much sticking with the idea of launching a foldable smartphone and that it will seriously work to that end this year. It was reported a few weeks ago that the foldable smartphone will have a 7.3-inch foldable OLED panel. The device would fold inwards to act as a phone and outwards to double as a tablet. Samsung Display is said to be working on a panel that folds in and out smoothly without showing any creases. Samsung hasn’t given any timelines for its foldable panels in the press release but at least it’s confirmation that the company has made them a part of its strategy for 2018. As it stands, though, it’s unlikely that the foldable smartphone will be released by the end of this year. The post Samsung might finally start producing its foldable smartphone this year appeared first on SamMobile. Samsung earned $14.13 billion in operating profit in the fourth quarter of last year but this stellar performance can’t really be attributed to the company’s mobile division. Samsung’s mobile business has been under pressure for quite a while now due to several factors such as increasing competition from Chinese rivals in key markets. The company released its earnings results for Q4 2017 today and they reveal that the struggles of its mobile business are far from over. Samsung’s mobile division posted 25.47 trillion won or $23.8 billion in consolidated revenue for the quarter with an operating profit of 2.42 trillion won or $2.2 billion. Revenue is flat compared to the same period in 2016 while the operating profit is slightly down compared to 2.50 trillion won or $2.34 billion in Q4 2016. Samsung attributes this to a surge in marketing costs during the holiday season. It also mentions that total smartphone shipments decreased in Q4 2016 due to the lineup optimization of its low-end models. Samsung does point out that shipments of flagship products like the Galaxy Note 8 were up compared to Q3 2017. The company doesn’t provide shipment figures so it’s difficult to ascertain precisely how many units it shipped in the previous quarter and by what percentage shipments of its premium handsets increased. Samsung expects its mobile division to perform better in 2018 on the back of growing replacement demand for premium smartphones. It’s also going to optimize its mid and low-end lineups further to achieve qualitative growth of the smartphone business. However, the company forecasts weak demand for smartphones and tablets in the first quarter due to low seasonality, not to mention the fact that many customers will hold off buying a new flagship until the Galaxy S9 comes out. Samsung expects to increase its shipments in this period by pushing the new Galaxy A8 and Galaxy A8+ (2018). From the looks of it, it’s going to get worse before it gets better for Samsung’s mobile division. It’s already having to deal with saturation in the flagship segment and the company has been coming under increasing pressure from the likes of Xiaomi in key markets like India. It’s being squeezed at both ends and unless Samsung takes major steps to increase its profit margins while also effectively competing against Chinese rivals, it’s mobile division may not contribute much to the bottom line. The post Samsung’s mobile division continues to struggle appeared first on SamMobile. Is Samsung about to release final Galaxy S8 Android 8.0 Oreo update? It looks like Samsung is sending out a final thank you message to everyone who participated in the Galaxy S8 and S8+ Oreo beta program and could be close to releasing the official update. A few users are seeing a new notice about the beta in the Samsung Members app, with the Galaxy Beta team simply saying that it is doing its “best to distribute the official S/W version”. No date or ETA is mentioned this time around, but since the beta team had earlier said it’s aiming for a stable release by January 31st, could the update be on its way? Galaxy S8 Oreo update: Official rollout imminent? It would be improper to come to conclusions based on the latest beta notice, but at least users outside the US could see the final update come out before the week is over, if we go by how long it took Samsung to release the Nougat update after the Galaxy S7 beta program ended. Even if they don’t, stateside Galaxy S8 and S8+ owners are likely to go through a longer wait than others as the beta program for North American users ended only four days back. As mentioned in the notice, folks using the beta will get the final release a day before everyone else. Not a very good gesture for those who acted as guinea pigs for the company, but with the second month of 2018 almost here, we just want to see that notification about Android 8.0 Oreo being available, no conditions applied. Fingers crossed we don’t have to wait too long now. The post Is Samsung about to release final Galaxy S8 Android 8.0 Oreo update? appeared first on SamMobile. Cryptocurrencies and blockchain technology have seen a huge spike in interest in the last couple of years. With exponential returns on investment, the cryptocurrency market has seen huge investments recently. While some prefer to just buy the Bitcoin or other cryptocurrencies for quick returns, the more tech-savvy ones opt for mining coins using high-end mining hardware. This has resulted in huge demand for high-end graphics cards and customized mining rigs. A few months back Samsung made its first move in the cryptocurrency space when it built a Bitcoin mining rig out of old Galaxy S5s. While it was a fun and an experimental project, it seems Samsung is now reportedly interested in manufacturing commercial cryptocurrency mining hardware to tap into the market demand. According to a report from the South Korean outlet The Bell, Samsung has reportedly started manufacturing ASIC (application-specific integrated circuit) chips specialized for Bitcoin and other cryptocurrency mining. Samsung will be supplying these ASIC chips to an unnamed Chinese mining equipment provider starting from this month. The report further states that Samsung’s involvement in this collaboration will be primarily as a foundry operator and that the mass production of chips will begin by the end of this month. To be clear, Samsung won’t be selling chips to the public that are capable of mining cryptocurrencies. It’s only going to provide these chips to a manufacturer of bitcoin mining equipment based in China that it partnered with last year. A couple of months back, there were also reports about Samsung signing a deal with Baikal, a Russian Bitcoin mining hardware firm, to supply them with ASIC chips. Last year, Samsung emerged as the world’s largest semiconductor company, ending Intel’s 24-year reign at the top. So, considering Samsung’s aggressive expansion of its semiconductor business, it’s not entirely surprising to see Samsung entering the cryptocurrency mining market in search of new opportunities. The post Samsung is reportedly making mining hardware for cryptocurrencies appeared first on SamMobile. [Poll] Galaxy A8 (2018) owners: How do you like the fingerprint sensor placement? As we said in our Galaxy A8 (2018) and Galaxy A8+ review, the fingerprint sensor is easier to use on Samsung’s latest mid-range phones compared to the company’s 2017 flagships, but it’s still not in the ideal location. That’s especially true on the 6-inch Galaxy A8+; the sensor is housed in the same cutout as the rear camera, so there is some amount of hand movement involved between tapping the sensor and using the phone. Your take on the Galaxy A8 (2018) and A8+’ fingerprint sensor? Again, it’s not as bad as it was on the Galaxy S8 or Note 8 (although many thought the sensor’s placement wasn’t an issue on those devices, either). Since the sensor is placed below the camera, chances of the user smudging the camera lens are also fewer than they are on the aforementioned flagships. Our overall experience of using the A8 and A8+’ fingerprint sensor was a positive one, and we’re interested to know how you feel about the placement of the sensor on your Galaxy A8 or A8+. We’ve created a poll, which will help other SamMobile readers know what to expect from the fingerprint sensor on these devices should they decide to buy one, in addition to telling us how your experience compares to ours. In fact, the idea for the poll came to us from SamMobile member PRODBYECHELON asking A8 and A8+ owners whether they touch the camera by mistake while using the fingerprint sensor. So go ahead and vote, and also let us know your thoughts in the comments section! How do you like the Galaxy A8 (2018) and A8+' fingerprint sensor placement? The post [Poll] Galaxy A8 (2018) owners: How do you like the fingerprint sensor placement? appeared first on SamMobile. So you’ve got yourself one of Samsung’s new mid-range phones or are planning to do so, either because you love selfies or because you’re looking for a flagship-like experience without paying the price a flagship would command. The Galaxy A8 (2018) and Galaxy A8+ are good choices for people who fall in either camp (or both), as we said in our review. There’s a lot to do on these phones, from taking beautiful selfies that blur the background to viewing YouTube videos on the immersive 18:5:9 Infinity display, but if you’ve just purchased one, here are a few things you should set up on your A8 or A8+ before doing anything else. This is something your A8 or A8+ would have suggested when you were going through the initial setup after turning the device on for the first time, but if you skipped it, you should set up your fingerprint and also enable facial recognition. On a security scale, the former is better and the latter is more convenient. But you don’t have to choose and can use both facial recognition and the fingerprint sensor to unlock the phone. To set up your fingerprint, open the Settings app, tap Lock screen and security, then tap Fingerprint Scanner. 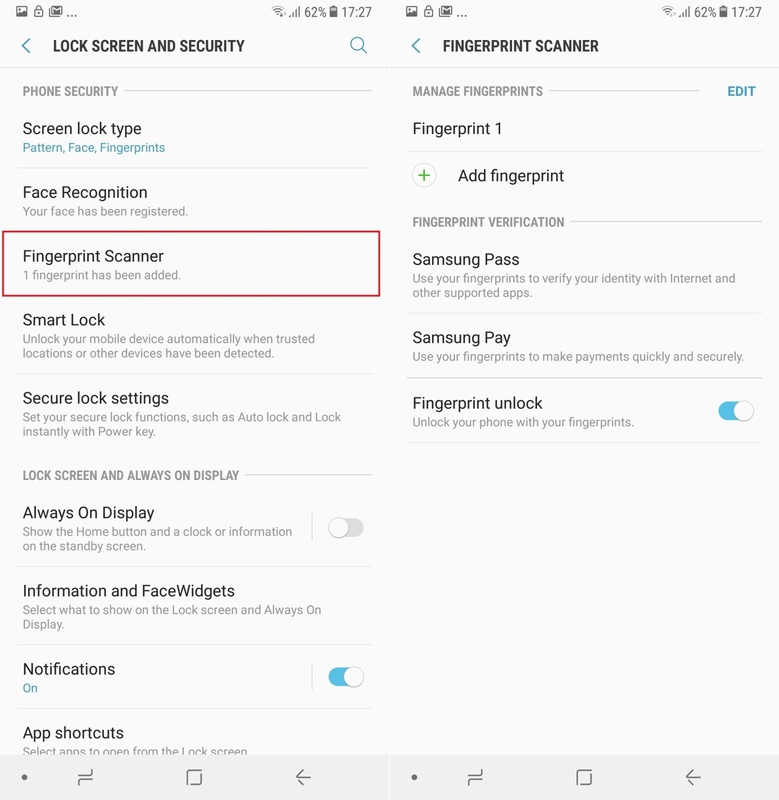 You’ll first need to set up a pattern, PIN, or password as an alternative when the fingerprint sensor doesn’t work (or when you can’t pick up the phone to use the rear-mounted fingerprint scanner). Then, simply follow the instructions to register your fingerprint, then select the Turn on option when asked if you want to enable fingerprint unlock. It’s not over yet. Did you know you can add the same finger as a separate fingerprint? This makes the sensor more accurate, as it gets double the fingerprint data for the same finger. 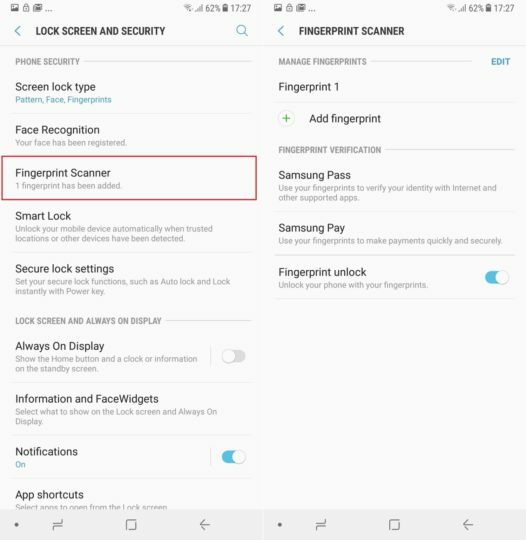 To add another fingerprint, you can tap the Add fingerprint option in the Fingerprint Scanner menu, then use the same finger you used earlier. Of course, you can also add another finger, like the index finger on your left hand for when you can’t pick up the phone with your right hand. Now, for facial recognition, go into Lock screen and security in the settings and tap Face recognition. 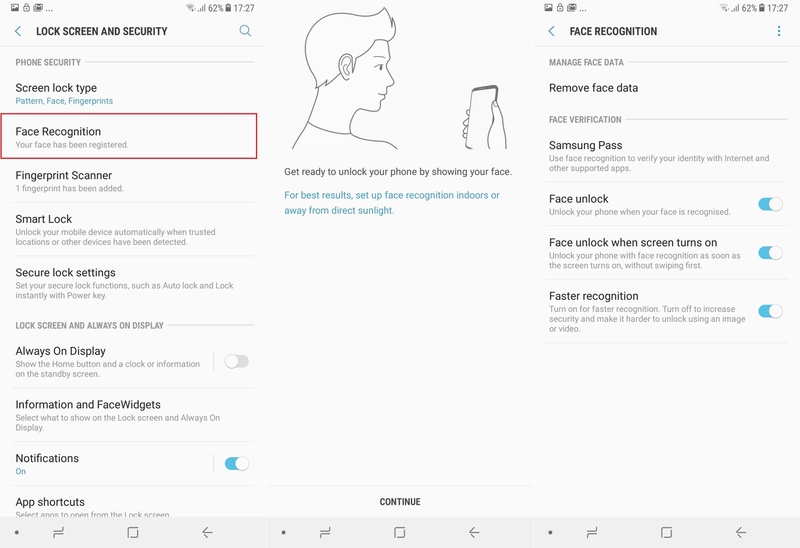 Follow the instructions to register your face, tap OK on the next screen to enable facial recognition, then select Turn on when asked if you wish to unlock the device using facial recognition. If you want, you can choose between the phone automatically unlocking when you press the power button to wake the screen up, or waiting for a swipe on the lock screen. This is done in the Face recognition menu. Remember that facial recognition isn’t too secure, as someone can use an image or video of your face to fool the phone into unlocking. This is another thing that you get asked to do during the initial setup process. 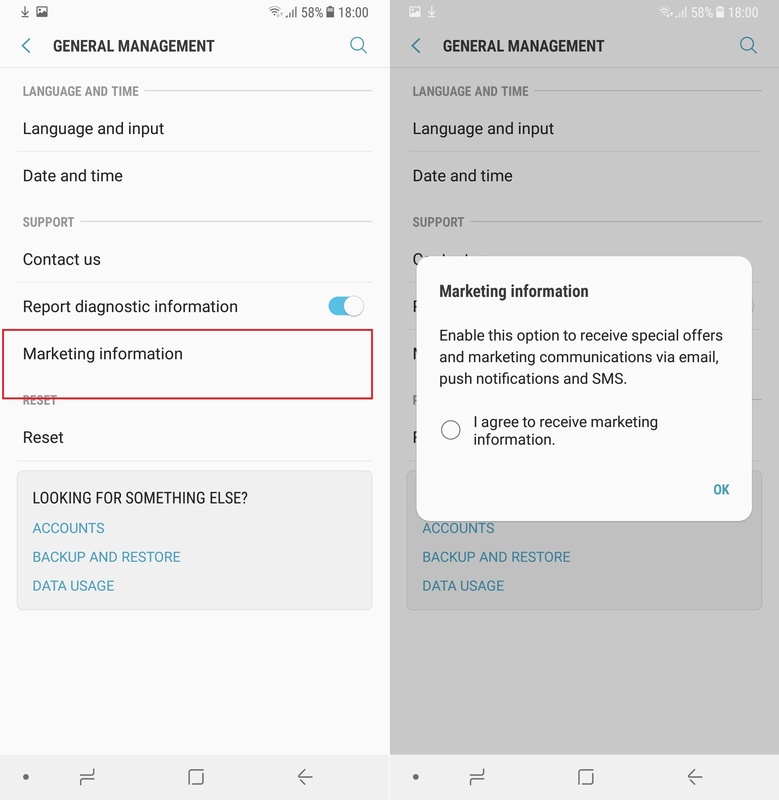 A Samsung account can come handy for backing up basic data like call logs, messages, alarms, keyboard dictionary (from Samsung’s stock keyboard app), phone settings, and even your saved cards from Samsung Pay, all of which you can restore on another Samsung device. It’s also required to access the Theme Store. 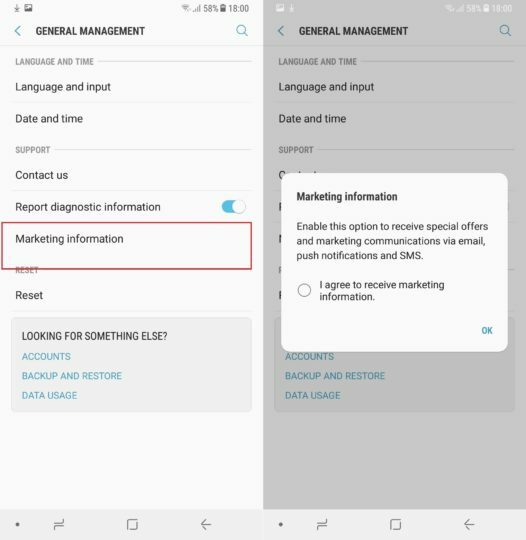 If you skipped setting up your Samsung account earlier, you can do that by tapping the Add account option in the Settings » Cloud and Accounts » Accounts menu and selecting Samsung Account. Follow the instructions to sign in or make a new account if you don’t already have one. 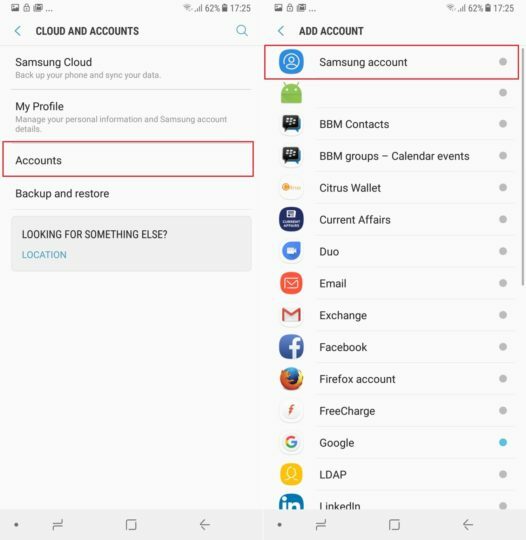 Bonus: Once you have your Samsung account logged in, disable gallery sync to Samsung Cloud from the Settings » Cloud and Accounts » Samsung Cloud menu. Samsung Cloud only offers 15GB of free storage, and you can run out pretty quickly once you build up a library of photos on the device. To backup photos, use Google Photos, which allows free unlimited backup of images up to 16-megapixel resolution. Quality is slightly degraded by Google Photos, but the difference is usually negligible considering the unlimited storage Google is offering you. Of course, if you use a microSD card, you can always copy your images to a PC by connecting the phone via the USB Type-C cable in the box. 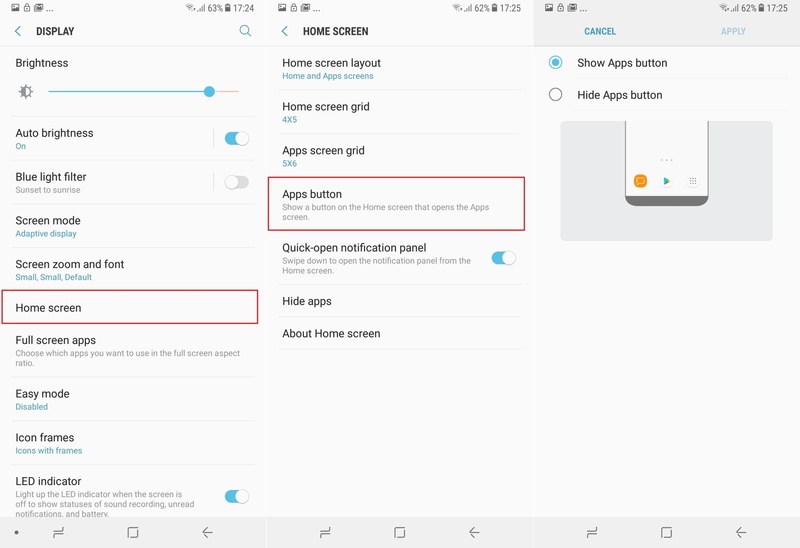 By default, on the latest versions of Samsung’s software (dubbed Samsung Experience), accessing the list of apps installed on the device is done by swiping up or down on the home screen. 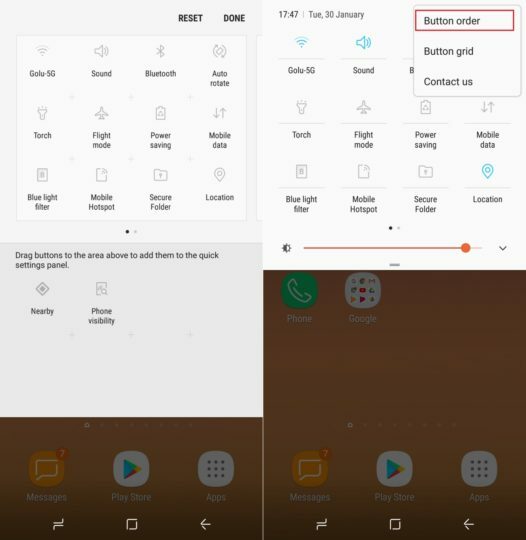 If you prefer the traditional button in the home screen dock (the bottom-most row of icons) for accessing the app drawer, you can enable it in the Home screen section of the Display menu in the phone’s settings. Here, tap Apps button, then select the Show Apps button option to enable the app drawer button on the home screen. This doesn’t disable the swipe gestures, so you can still swipe up or down to access the app drawer in addition to using the button. Bonus: You can also use the swipe down gesture on the home screen to open the notification panel. 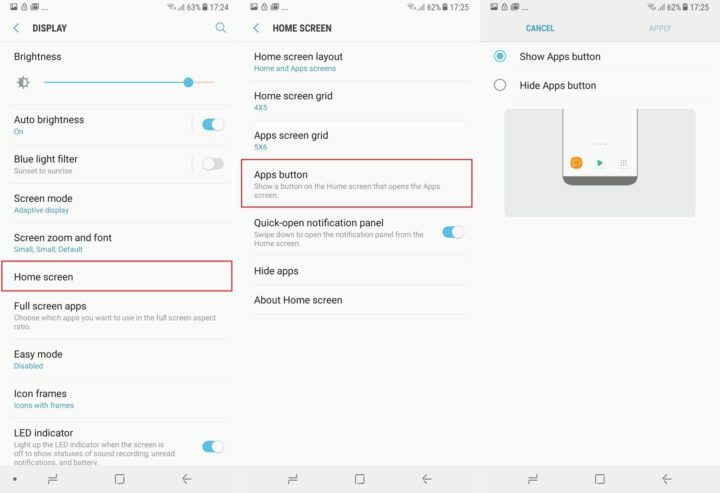 Enable the gesture by turning on the Quick-open notification panel option in the Home Screen section of the display settings. If this option is enabled, the app drawer can only be brought up by swiping up on the home screen. The A8 and A8+ come with Bixby Home, a basic implementation of Bixby that doesn’t require a dedicated hardware button. Bixby Home is a one-stop destination where you get recommendations based on your usage patterns. Into Facebook too much? You’ll get Facebook notifications here. If the phone sees that you stop using it for hours on end at a particular time, it will offer to set a reminder to tell you that it’s time to sleep at that time. Information such as upcoming schedules and the day’s weather are also shown in Bixby Home, in addition to things like YouTube and music recommendations. If you don’t want to use Bixby Home, there’s nothing you need to do other than never swipe right on the home screen. If you want to see what it’s about, you can access it by swiping right on the first page of the home screen. The first time you do it, you’ll need to sign in with your Samsung account and accept a couple of terms and conditions. Bixby Home will then start working on putting together recommendations and other data as you go about using your phone. It takes a few days to become truly useful, but feel free to check back on Bixby Home from time to time. The floating camera button was introduced with the 2017 Galaxy A series phones. It lets you have a second shutter button inside the camera app, one that can be moved anywhere on the screen so you can easily take photos without reaching for the volume buttons or the default shutter button, which can be hard to do at times. 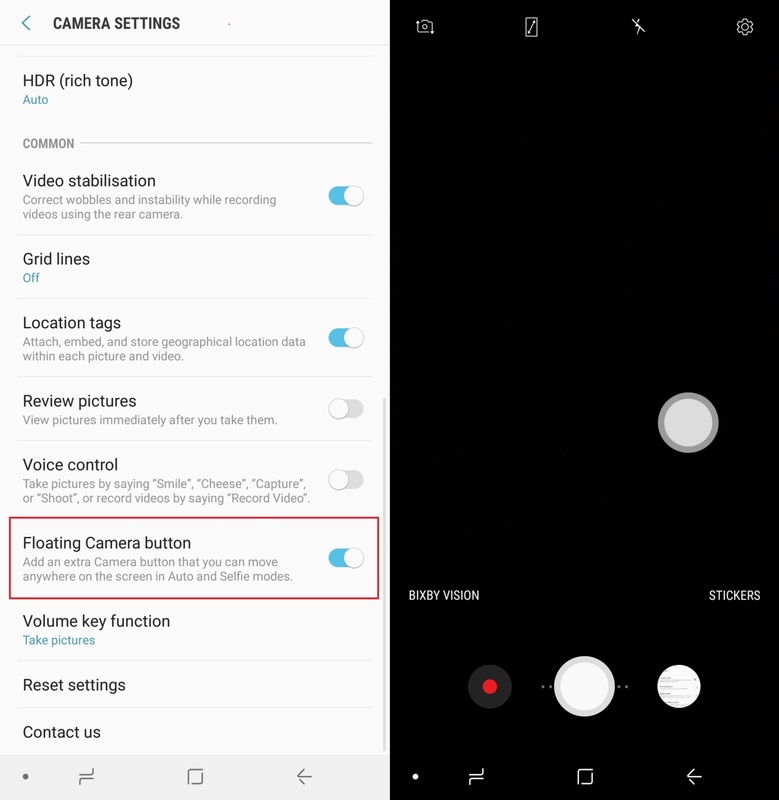 To enable the floating button, open the camera app, tap the settings button (the cog icon at the top right of the screen), then scroll down to find the Floating Camera button option. Once enabled, you’ll see the second shutter button inside the camera app, and you can just drag it to move it where you like. Bonus: If you’re in the camera app and haven’t already taken a Live Focus selfie, well, you can do it now. Swipe up in the camera app to switch to the front camera (skip this if you’re already in the front camera), tap the Live Focus button, position the phone in front of you, wait for it to say Live Focus ready, then tap the shutter button. 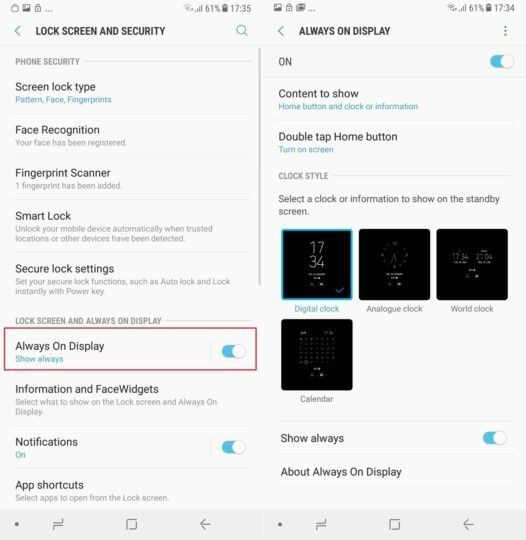 If you’re moving from a non-Samsung phone that had stock Android’s virtual on-screen back, home, and multitasking/recent apps keys, you might not be comfortable with Samsung’s setup, which has the back key on the right of the home key. This is what we prefer, as the back key is used far more option than the recent apps key and is easier to reach on Samsung’s default setup, but that doesn’t mean you have to agree. If you want the stock Android arrangement, you can switch things up in the Settings » Display » Navigation bar » Buttons layout menu. Bonus: If you don’t want to see the on-screen navigation bar at all times (handy for increasing the screen estate available to apps), you can enable a small circular icon next to the navigation keys. This icon can be double tapped to make the navigation bar disappear unless called upon with a swipe up from the bottom of the screen. Another double tap, and the navigation bar will show up at all times. Enable this icon from the navigation bar settings by toggling the Show and hide button. There are six default quick toggles that you see when you swipe down to open the notification shade, but some of these, like the Wi-Fi or airplane mode toggles, aren’t frequently used by most folks. But you can easily customize the quick toggles to see options that you would use more often. To do so, drag down the notification shade, then expand the quick toggles with another down swipe to see all the available options. Then, tap the three-dot button on the top right, then select Button order. Now, press and hold toggles to move them to the desired locations, then tap Done at the top right of the screen. The first six toggles are what you see by default, so you can add the important toggles (like the flashlight toggle) in these positions for quicker access. Bonus: You can also make the display brightness slider visible in the primary notification panel, right below the six quick toggles. By default, it is accessed by expanding the full quick toggles menu. To change this, swipe down twice from the top of the screen to expand the quick toggles menu, then tap the down-pointing arrow next to the brightness slider. Here, enable the Show control on top option to always see the brightness slider in the main notification shade. If you’re one to keep staring at your smartphone until you fall asleep from exhaustion, using a blue light filter on the display is recommended. Blue light emitted by electronic displays can make it hard for the brain to create the chemical that signals your body that it’s time to sleep. 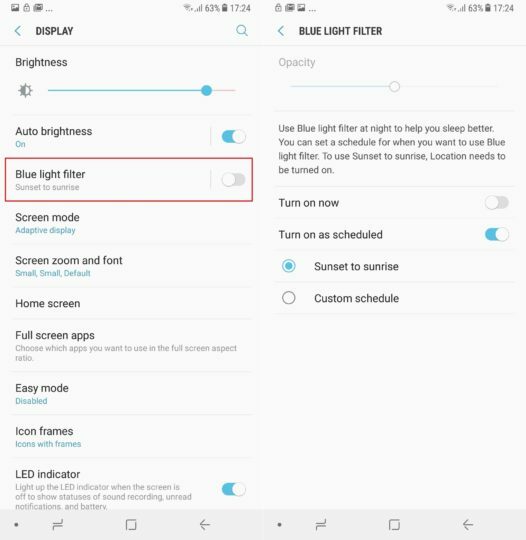 Samsung phones now come with a blue light filter option built in, and you can set it up to be automatically enabled at a certain time of the day. It can also be toggled on and off at will by using the blue light filter toggle in the quick toggles. To set it up, go into Settings » Display and tap Blue light filter. 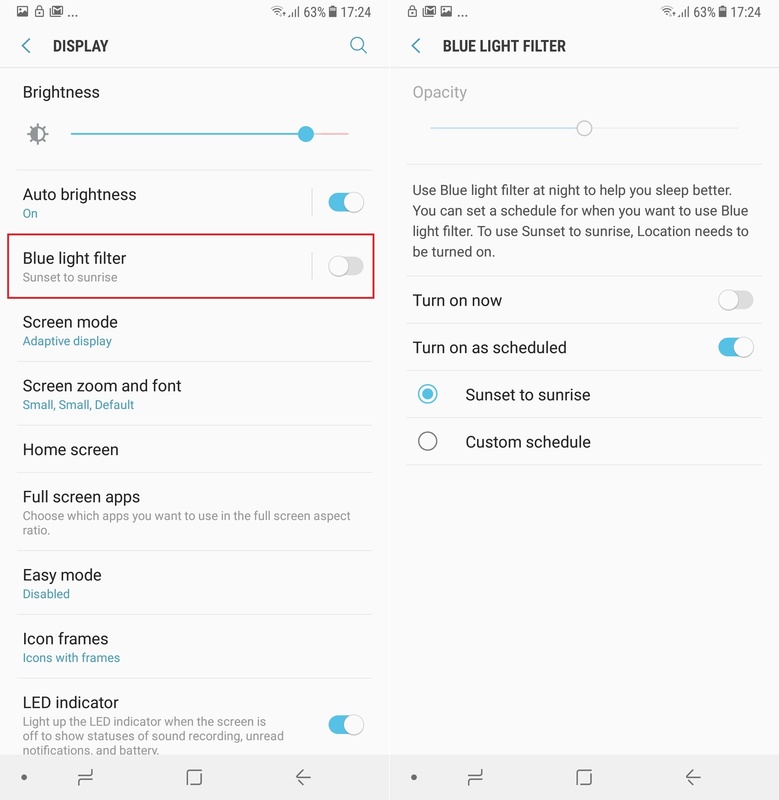 Here, enable the Turn on as scheduled option, then allow location access to the blue light filter. This will allow the phone to automatically enable the filter at sunset and disable it at sunrise. You can also set a custom schedule based on when you go to sleep and wake up. 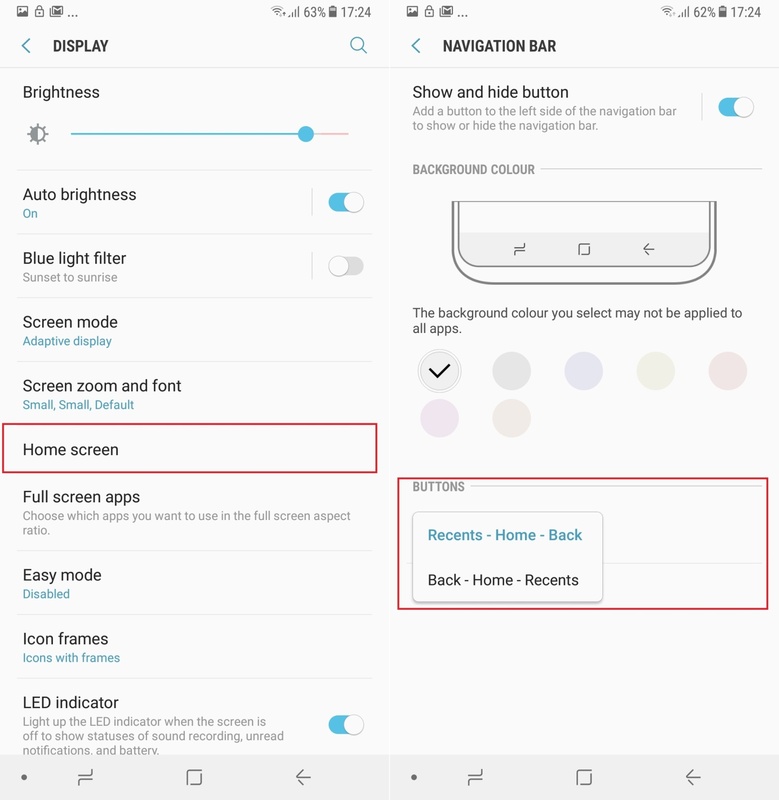 Bonus: You can also change the display mode to make the colors on screen look more natural, although that takes away from the beauty of AMOLED displays. 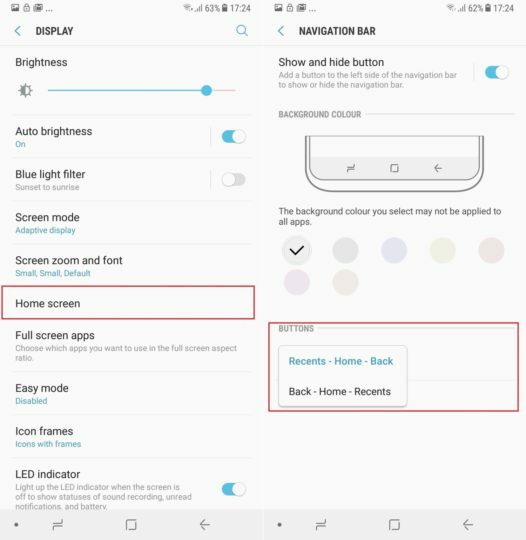 To change display mode, use the Screen mode option in the display settings. You can also change the color tone of the screen here, as long as you stick to the default Adaptive display mode. Warm is for redder whites and cool is for bluer whites; take your pick, or keep things neutral. Samsung Pay, if available in your country, is the best mobile payment service out there, and you should set it up on your A8 or A8+. To do so, open the Samsung Pay app from the app drawer, then follow the instructions to sign in to your Samsung account and add your cards (you might need to update the app the first time you run it). Once you’ve added a card, you can access Samsung Pay from the home screen or lock screen by swiping up from the bottom of the display; the same gesture works for accessing Samsung Pay when the phone is locked and the screen is off, so it’s always at your beck and call. Always On Display (AOD) is a handy feature for seeing the time and notifications on the phone without ever waking it up, and you can customize it to suit your needs. One important AOD feature is the option to show the home button and double tap it to wake the screen up. You can also decide if you want to see only the home button, or see the clock and other information as well. AOD can be set to be enabled at certain times instead of always showing up, and you can also choose from various clock styles. To customize AOD, open the phone’s settings, go into Lock screen and security, then tap Always On Display. Change the required settings here to modify AOD to your liking. Remember that you can also disable AOD completely to save battery life or toggle it at your whim using its quick toggle in the notification shade. This is something most users miss out on during the initial setup and enroll into marketing information from Samsung, which can include anything from popups about 100 GB of free Microsoft OneDrive storage to ads inside the theme store, both as notifications and as SMS/push messages. To opt out, open the phone’s settings, go into the General management section, then tap Marketing information. On the screen that pops up, deselect the I agree to receive marketing information option. Check out more Galaxy A8 (2018) tips here, and also see general tips for Samsung devices in our tips and tricks section. The post Galaxy A8 (2018) Tips: 11 things to do on your shiny new A8 or A8+ appeared first on SamMobile.